The easy DIY old lady baby costume ideas for Halloween can have your baby dressed up and looking like a 100 year old grandma in record time for very little money. Be sure to have your batteries charged and the camera nearby and ready to shoot. This will be a once in a lifetime photo op that you will not want to miss. After all, seeing a baby just learning to walk with grey hair, wrinkles pushing a walker is well..hilarious. This wig from Antiqueandorunique will be the crowning glory of your little, old lady's "look". Disclaimer: Always use your own judgement concerning your child's safety regarding all tutorials and/or information found on this website. Any wig with short, curly grey hair that looks like it was just given a nice, tight perm at the local beauty parlor will do but a wig sized to fit an adult may require a few alternations to make it smaller. How to Make a DIY Wig for an Old Lady Baby Halloween Costume that is CRAZY Easy! This tutorial for making your own grey haired costume wig out of yarn is pretty straight forward but a wig made from cotton balls is much simpler and less expensive. Are you ready? I told you that the instructions are SO darn easy and proof is in the directions! One (1) close fitting knit baby hat (with string ties just in case baby wants to tug) to use as the wig base. Two (2) big bags of plain, old cotton balls. One will probably be enough but get two just in case you start to have fun and would like for this Grandma to have a super big bun. Step Two: Very lightly spray the stretched cotton balls with the grey spray paint and allow to dry completely. A very light coverage so that the white shows through is advised. Step Three: Start to glue the now stretched AND lightly painted cotton balls onto the knit cap serving as your wig base. Glue thin layers on the front, sides and back from the nape to the crown to the point where Granny's bun will be. Create the bun by mashing together a pile of the cotton pieces securing it with a ribbon. See? This has to be one of the easiest tutorials I have ever written and, take it from me, the results are "retirement home ready"! The cotton looks just like the white hair of a 100 year old lady. Choose a dark, floral print dress knee length or longer. Accessorize the dress with a shawl, a beaded (baby-safe) necklace and/or large brooch, tights and old-fashioned looking ankle boots or shoes. Remove the lenses from of a pair of old eye glasses and add a neck chain for further effect. This is worth it to get one photo even if baby refuses to wear them for Trick or Treat. Very little, if any, makeup is necessary but if you aren't willing to leave well enough alone, some lipstick and faux wrinkles can be applied for fun. 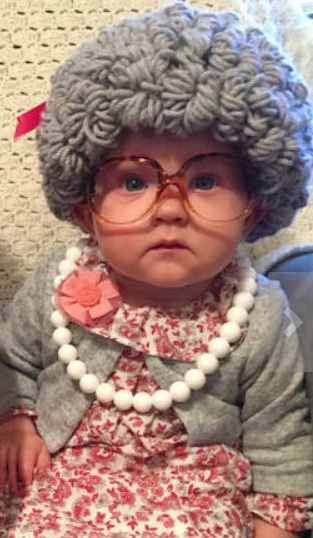 These old lady baby costume ideas should get you started but feel free to add your own elderly touches to the outfit and then return to Unique Baby Gear Ideas to share your photos on our feature page. Happy Halloween!